This Cabernet Sauvignon is one with a high reputation and a price to match it. 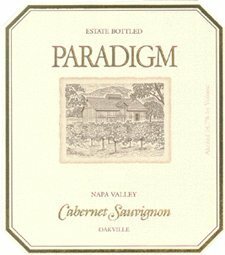 Paradigm Cabernet is one that I had been craving to taste for some time and I was somewhat disappointed. Don't get me wrong, the wine was great but it just wasn't how I pictured it. This wine was very powerful and robust. I got lots of cedar, leather, and dark fruit and to tell the truth it lacked the elegance I have come to expect with wines in the $50-$60 dollar range. I would guess that after maybe 5-10 years this wine could develope into something alot more pleasing so I won't write it off completely. I would rate it a 90 point wine and would only suggest it for big cabernet fans with lots of money to spend. If its not subtle and elegant now where do think the elegance will come from in five years time? Sure the tannins will soften but is there anything to reveal?